This is according to Prof Franziska Meinck, new extraordinary professor at the Optentia research focus area on the North-West University’s (NWU’s) campus in Vanderbijlpark. Prof Meinck recently delivered her prestige lecture at Optentia. 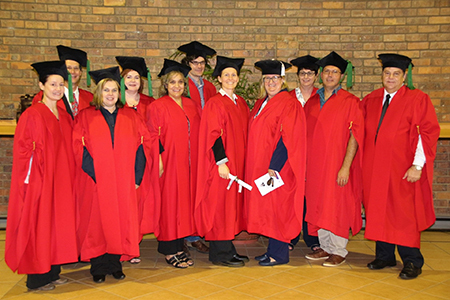 This academic procession welcomed Prof Meinck into the cadre of extraordinary professors at Optentia. In the front from left are Dr Angelique van Rensburg, Prof Elrie Botha, Prof Ansie Fouché, Prof Franziska Meinck, Prof Susan Coetzee-Van Rooy, Dr Johan Steytler and Prof Ian Rothmann (Director: Optentia). In the back from left are Prof Jaco Hoffman, Dr Hayley Walker-Williams, Dr Thees Spreckelsen and Prof Mirna Nel. When violence against children is investigated, it refers to all types of violence: maltreatment of a child by parents or caregivers or violent treatment of a child by anyone who has power over them. This violence can be physical, emotion or sexual in nature, and also includes neglect. Another kind of violence manifests in the form of intimate partner violence occurring between young people who are dating or have been dating. This kind of violence can again be physical, emotional or sexual in nature. It can also be of an economical nature, where a partner withholds monetary support to make his/her partner more dependent. Bullying is a type of violence that is, regrettably, quite familiar to many people. It can be defined as violence by children or groups of children directed at a child that is not related to them. It normally takes place in recurring incidences and have the potential to cause harm. Violence among the youth also occurs within the community. It refers to violent assaults between groups or individuals, with stabbing and shooting as an unfortunate example of gang violence in the South African context. The problem of violence is certainly not unique to South Africa. In a recent nationally representative study by the University of Cape Town (UCT), an average of 35% of children has indicated that they have experienced some sort of violence in their immediate environment. Prof Meinck is of the opinion that this issue can be seen worldwide in many middle-income countries. In UCT’s study 60% of children indicated to have experienced some kind of emotional violence, 10% admitted to have been in situations of neglect and 10% indicated that they have experienced sexual violence. A staggering 50% have been exposed to violence within their community. Social workers are working hard, dealing with huge caseloads and in many instances feeling like they are facing enormous challenges which are very hard if not impossible to overcome. Prof Meinck says that research have shown that children who have experienced multiple types of violence are less likely to take important medication, have considered or even planned suicide, are more likely to abuse substances and consume alcohol, are likely to experience poor sexual health and become perpetrators of violence later in life. She argues that these children should be the focus of the social work effort. Since resources are lacking, she also recommends that the focus must be on interventions that have been clinically proven to be effective within the South African context. She suggests that more time and effort should go into prevention of violence and that there should be a focus shift in working towards prevention. “If we can prevent violence, we are making a community safer. We need to equip parents with the tools to handle their children’s negative behaviour to prevent situations that escalates into violence,” she says. Prof Meinck suggests child abuse prevention programmes for parents that are available on the World Health Organisation’s website. These programmes have been vigorously evaluated and have shown significant decreases in maltreatment of children within families while increasing positive parent/child interactions. The programmes are free of charge, but Prof Meinck recommends that facilitators be trained prior to initialising these programmes with groups. The programmes can be downloaded from http://www.who.int/violence_injury_prevention/violence/child/PLH-manuals/en/.